Why is Malaysia an attractive market for property? If you are young and planning to enter the workforce in the next three years, you will have the company of seven billion fellow inhabitants of planet earth. By the time you are ready to retire – assuming you’ve been able to find a job in the first place – there will be two billion more. You will have watched the world population grow by 30% and I don’t know what you are going to do about it. The two billion new people we are talking about are unlikely to come from the West where recreation is no longer remotely synonymous with procreation. They will come from countries such as China and India where people are pretty clever. For the first time in history they will be a colossal economic force largely united by nationality, coming from financially independent families and looking for a job. Maybe your job. I don’t want to scare you, but if you are reading this article instead of doing your homework, please get back to your studies immediately. 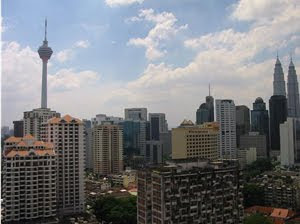 Malaysia, as an under-populated resource-rich country, will become increasingly attractive. The next wave of migrant workers into Puchong and Ampang may well be coming from the same countries as 100 years ago but this time they won’t be miners or rubber tappers. They will be carrying laptops and living in condos. My point is that as its knowledge economy gathers pace, Malaysia will continue to grow at a faster rate than a mere organic 2% and the impact on real estate values is going to be substantial. There is no point grizzling about the terraced house you could have bought in Bangsar when the biggest building there was the Apilektrik; the opportunities are here and now, and property is still cheap. If you want a new three-bedroom bungalow for RM250,000 or a quarter-acre building lot for RM150,000, they are all available within an hour’s drive from Kuala Lumpur. You would think that agricultural land would have shot up in value but rural smallholdings can still be bought for RM20,000 to RM25,000 per acre and they will give you a net income of 10% or so if you’re prepared to put in the time to manage them properly. In the secondary market, bargains abound. There is a tremendous miss-match between buyer and seller and the bottleneck revolves around antiquated loan recovery systems. Even now, banks are sitting on billions of ringgit worth of non-performing loans, which may eventually be parcelled up into huge packages and sold off to other institutions at so many sen in the dollar. Banks will moan about the existing foreclosure legislation and so forth which gives them little choice, but isn’t this a cop out? There is a need for fresh, market-driven solutions to the problems of foreclosure and sale, starting with the archaic auction process, which is long overdue for an overhaul. I don’t understand why the banking industry is not pushing harder for reforms, which would enable them to take more innovative and proactive initiatives. For example, if my bank approached me with a RM1mil package comprising a few acres of agricultural land in Johor, a low-cost flat in Rawang and an apartment in Kajang, wrapped up in an attractive 80% mortgage deal, I’d probably take it. In my personal case, I’d take it in disbelief that any bank might think I could repay before I popped my clogs, but many other customers would see it as a unique long-term and diversified stake in the market. Malaysia has many other hidden assets, one of which is the ability to complete big development projects in challenging circumstances. The Government has recognised this and organises roadshows to developing countries, encouraging Malaysian professionals and developers to promote their capabilities. The market out there is massive; it is estimated China will build 430 billion sq ft in about five million buildings by 2025. These numbers are almost too huge to comprehend, like the distance to the moon or the number of times I have to explain to my wife that golf is good for business. To maintain their slight lead in the region, I feel that professionals might be given some fiscal and financial incentives to export their expertise. An example would be double-tax deductions for travelling expenses. Other countries such as Australia have practiced this with success. See you in Shanghai, Bruce. GEORGE TOWN: The property development and construction players want Budget 2010 to remove, or keep to the minimal, the levies and stamp duties on private projects and property transactions. Penang Master Builders and Building Materials Dealers Association (PMBBMDA) president Finn Choong said levies for project contracts and foreign workers had raised construction costs, which had to be passed on to consumers. “Presently these levies are high in comparison with those of developed countries and have eroded the competitive edge of the local construction industry,” he told StarBiz. PMBBMDA also urged the Government to remove approved permits for new construction machineries. “This will spur the adoption of new and green construction technology by local construction companies,” Choong added. The Government should also treat construction companies as venture capital businesses that were eligible for tax holidays because construction firms “also undertake high risks,” he said. Meanwhile, Real Estate and Housing Developers’ Association (Rehda, Penang Chapter) chairman Datuk Jerry Chan said the budget should give grants to first-time house buyers for properties of a certain price range. “We would also like to see stamp duty waiver for transfer of properties and housing loans,” he said. The stamp duty ranged from 1% to 3% depending on the value of the properties transferred, while the stamp duty for housing is 0.5% of a total loan amount. Mah Sing Group Bhd has received the Economic Planning Unit (EPU) approval to buy prime land in Cyberjaya, on condition the paid-up capital of wholly-owned Myvilla Development Sdn Bhd, is raised to at least RM100,000. The deal involves the purchase of freehold land, measuring about 466,391 sq m, from Cyberview Sdn Bhd and Setia Haruman Sdn Bhd for RM130.5 million, with the option to buy an adjacent 25,570 sq-m commercial land. Mah Sing plans to build medium to high-end houses under the brand Garden Residence, with an estimated gross development value of about RM690 million. PRIVATELY-HELD Global Rail Sdn Bhd and its partner from China have jointly submitted a RM28 billion proposal to develop a high-speed railway and inter-modal freight system in Malaysia, linking economic corridors to major airports and seaports. Global Rail managing director Fan Boon Heng said the proposal was submitted on September 28 to the Ministry of Finance, the Economic Planning Unit and the Johor Menteri Besar. The project is a private finance initiative (PFI) with China Infraglobe Consortium, a global infrastructure development and logistics specialist. Fan said China Infraglobe has the financing in place to fully fund the project, which will be implemented in four phases over 10 years. He said the financial mechanism will be crafted such that the local government will have a total cost capped for the whole project and risks will be allocated to the parties best able to manage them. "It will free up the current government funds for public spending in other areas," he told Business Times in an interview. Fan said the implementation of the project to lay electrified double tracks will start from Iskandar Malaysia in Johor. Under the first phase, the parties involved will lay the tracks from Johor Baru to Gemas, while under Phase 2, the tracks will run from Gemas to Tumpat in Kelantan. Phase 3 will start from Kluang, with connections to the KL International Airport, Port Klang and the Port Klang Free Zone (PKFZ) in Selangor. 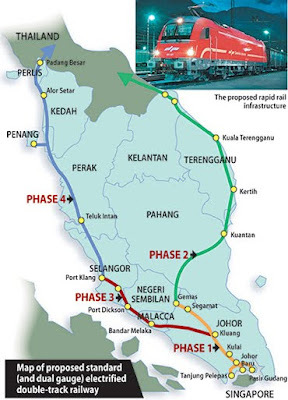 The fourth phase will be from PKFZ to Perlis and up to the Thai border. "We will call for tenders for local participation on the civil works, building of stations and yard facilities after we get the green light from the government. China Infraglobe will work with a European group on the systems portion," Fan said. The proposal is in line with the government's 2020 National Physical Plan on Transportation. "This development plan will transform Malaysia into a regional logistics hub for Asean and be the southern gateway to the overland logistics rapid freight system for China and Europe," Fan added. It is also expected to propel Keretapi Tanah Melayu Bhd into a major logistics and industrial corporation, enhancing and augmenting its role as a national rail and logistics services provider in passenger and freight services. Global Rail, set up in July last year, was founded by Fan, who previously headed ABB Daimler-Benz Transportation and, later, Balfour Beatty Rail Sdn Bhd for over 15 years. It already has jobs from Road Builder Sdn Bhd for electrification for a railway project in Batu Gajah, Perak, and from YTL Corp Bhd to supply automatic train protection system and railway point machines for its Sentul-Batu Caves railway project.